For several months, I've been chomping at the bit to get this article written. There is an addendum below the video. Is it just my imagination, or has there been a marked increase in anti-vaccination material? (Perhaps they get worked up by anti-vax celebrities and politicians like Donald Trump, Jim Carrey, Jenny McCarthy, Bill Maher, and others.) There are many conspiracy theories linked to vaccinations, and there is a range of intensity, including "governments use vaccines to control the population". This troubles me. No, it actually gets me angry. (There are people who will take any innocuous comment and say that the writer is angry, but in this case, I'm telling you right out of the gate how I feel. I've even "unfriended" people for spreading the stuff.) This will not be a detailed pro-vaccine apologetic, since too many people have their minds made up from emotional appeals and terrible reasoning, but I want to make some statements. Will I influence anyone to change their minds or even slow down and think rationally? That'll be the day. It's worth a shot (shot, get it?) though, so I thought I'd try, even though it will cost me some friends. Emotionally-provocative words like "Big Pharma" are added to conspiracy theories to poison the well, and have confused people about whether or not to get vaccinations. It affected me about the flu shot that my doctor recommended, but he persuaded me despite anecdotal "evidence" like the highly-publicized cheerleader's adverse reactions that were later debunked. And yet, I had no hesitation in getting my tetanus booster, because the tetanus infection frightens me, what with being often fatal and all. "Whaaaaat? Formaldehyde is used to embalm dead bodies, and you want that injected in you, Cowboy Bob?" It's true that there are additives in vaccines, but the conspiracists ignore the amounts, chemical compositions and differences, and other places that these "toxins" can be found — you get more of a kind of mercury in a can of tuna than an injection, and more formaldehyde by eating an apple than from a vaccine; your own internal mechanisms makes that stuff! We can reverse this to show the bad reasoning. How about a nice glass of wine, beer, or shot of rye whiskey? "Don't do that! It contains alcohol! Alcohol is used as a disinfectant, a motorcar fuel additive, solvent, and more. Do you really want that in your body?" This is similar to the faulty reasoning from vaccine opponents, as we have just seen. What I did was withhold pertinent information, especially the fact that there are different kinds of alcohol and different concentrations. The alcohol in your drink is only poison when it's abused. When people say that "Big Pharma" is withholding cures because they get rich from people staying sick, that really takes the rag off the bush. If you'd study on it for a spell, it's stupid even at surface level. Not only is such an accusation blatantly disparaging of the medical profession as a whole, but implies that the accuser has the ability to know the thoughts and motives of all those people. Add to that the false claim that vaccines cause autism, and the insult level is astonishing. Apparently the ones who say that they went into medical areas because they want to seek cures and help people are all liars, huh? Prove it, Pilgrim. It's even worse when professing Christians and creationists pass along anti-vaccine conspiracy theories, pseudoscience, empty claims, and outright lies. Otherwise intelligent people, even apologists, go in for this. Not only are they disparaging other Christians and creationists in the field, but they are indulging in the same logical fallacies that we call Darwinists out on! Further, they are not using critical thinking (which makes me wonder why I even bother to educate people on logic). Previously, I touched on the appeal to motive fallacy, where people claim to know why medical professionals withhold cures. People who make such claims need to be confronted: how do you know the motives, and where is your supporting evidence? For that matter, I've seen a combination of the appeal to motive fallacy coupled with the genetic fallacy (reject something because of the source), so my supporting links from the Centers for Disease Control and Prevention, WebMD, and other sources could be rejected because they come from "Big Pharma" and the US Government, who have all been condemned as evil by those people. 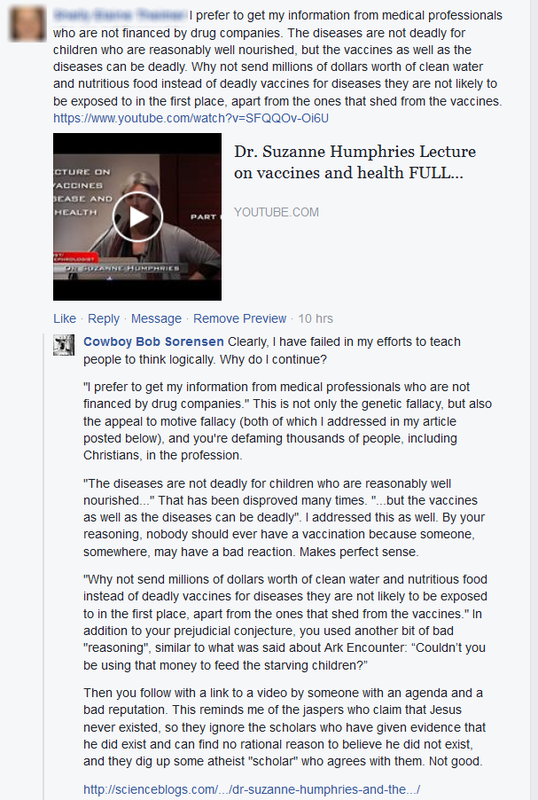 Pay attention to the anti-vax crowd and you'll see a whole heap of fallacies. There has also been an increase in natural this, natural that, natural the other thing. Recently, I've been hearing about refusal to vaccinate because of "natural immunities". (Some Christians have wondered if vaccines are unbiblical. It's fine to wonder, but don't exceed what is written in Scripture, and be careful about who gives you your anti-vaccination information.) I reckon that some of the people who push the strongest for natural remedies and immunities often have a financial interest in selling something "natural". As the saying goes, I'm just saying. In addition, I suggest being careful about your sources, as quite a few anti-vax sites are famous for false information to further their own agenda. Sounds like I'm being fallacious, but I'm saying to use caution. Many diseases have been eliminated or brought under control through vaccination, but none through homeopathy or hysteria. What could be more natural than eating peanuts? People develop severe allergic reactions to them. How about a bee sting? That's natural, but some people need some chemicals mighty quick or they could die. Did you need surgery or similar procedure? I wonder what kind of anesthesia was used, since the hospital stuff has chemicals. Maybe a few shots of rye helped deaden the pain. But surgery and other life-saving techniques are "unnatural", aren't they? Don't have it. Die naturally and fulfill Darwin's dream of eradicating the weak and unfit in the population. Survival of the fittest and all that. Or you can get sensible. Yes, some vaccines and medications are expensive. To claim that they are high-priced so the companies can get rich is rooted in ignorance and bias. Those companies employ people with advanced degrees who want to be paid (ever hear of student loans, as well as the desire to make a good living?) They have invested in people, research, testing, submitting for government approval, and more. These take time and expense, and it seems to me that there are people who think it should all be done for free. Maybe some people can donate their time and expertise, but their education probably was not gratis. You also don't hear about medication costs that have gone down over the years, especially after expenses have been recouped by the companies that paid for the research. As for me, I take seven prescriptions, and they have become affordable for the most part. 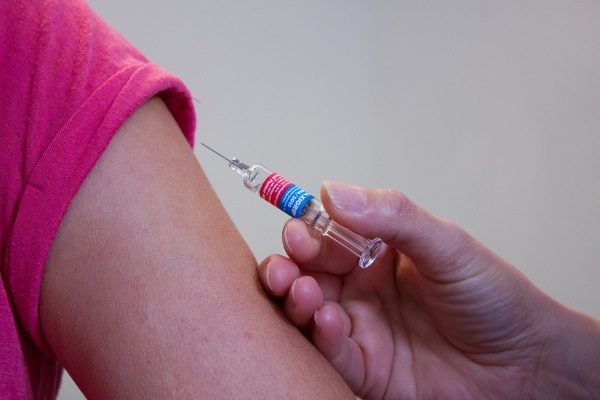 Is every vaccine safe for everyone on the face of the planet? Don't be ridiculous, I'm not saying that and don't know of anyone who is. There will be bad reactions in some people, just like in every medication. But the exception is not the rule, some people having reactions or bad experiences does not make it logical to condemn all vaccines or the entire medical profession. And for crying out loud, don't be hopping on the anti-vaxxer bandwagon because friends, celebrities and politicians are doing it! Are ya'll going to stop "thinking" with your emotions and listening to false reports, or did I just waste my time again? Think I sounded less angry than I expected. Perhaps doing some research settled me down; I thought this would take half an hour to write, but it went over three hours. I need a vaccination — I mean, a vacation. 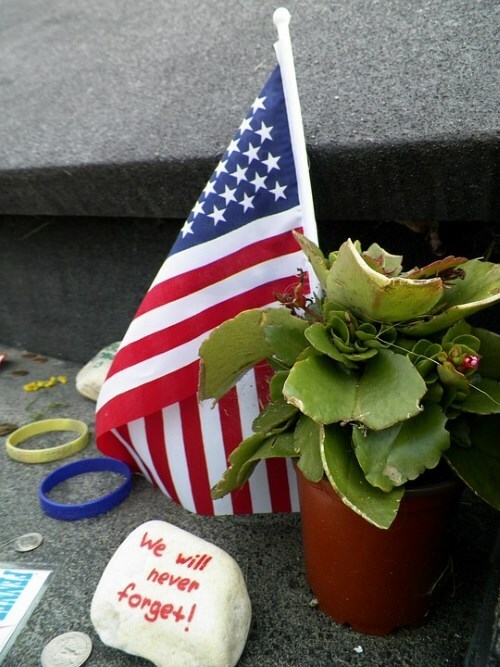 People have remembered significant national and global events many years after they happened. I've heard and read where people remember the day John F. Kennedy was assassinated, the 1941 attacks on Pearl Harbor, and other things many years later. I was working in the back of the Big Chain Company Store (now semi-defunct) with the shipping and receiving manager, getting merchandise ready for shipping. (I had lived in New York for just over a year.) One guy came back there and began telling us about the plane crashes, and I didn't believe him because he often told jokes that were in poor taste. After he convinced the manager and me, I went to the computer and saw that he was right. When the Internet went down, I became even more alarmed. What's going on? Millions of people were wondering this, but we knew that America was being attacked. The rest of the day was a daze for me. I listened to the radio while making deliveries, and missing many turns because I wasn't focused. Later, almost every house had an American flag attached to it one way or another, as did vehicles. Churches were filled. People were making themselves crazy watching the news, hoping for answers, new information, possible reports of military retaliation. Naturally, the news reports went from bad to worse. Fearmongers for ratings saying how terrorists could use atomic weapons and chemical weapons (Saddam Hussein used them against the Kurds in 1988, killing thousands). I was about to cross the Kingston-Rhinecliff bridge for a delivery a few days later, and I saw a plane flying low because it's near the small airport we have. I had to overcome my fear and press on, no, it's not nerve gas or something. Much later, I read and heard people who knew what they were talking about: chemical weapons need precise conditions to work, and both nuclear and chemical weapons require very difficult, timely, special handling. After churches were filled, they emptied out again. I believe this is because modern church-ianity does not believe and teach the Word, and cannot give answers to a world in need, even though they are in the Bible. Atheists used the terrorist attacks for their own ends. Some make big money writing books about the evils of "religion", while they and their disciples complain that Christians who do the heavy lifting in building hospitals, building schools, providing relief efforts, and more ask for donations to help support the work. Those sidewinders get rich off gullible, non-thinking atheopaths, attack a vague phantom of "religion", get rich, misrepresent Christianity and the Bible — and those sidewinders know full well that the September 11 attacks were by Mohammedans, and not "religion" as a whole. Much later, Clinton Richard Dawkins admitted, "There are no Christians, as far as I know, blowing up buildings. I am not aware of any Christian suicide bombers. I am not aware of any major Christian denomination that believes the penalty for apostasy is death." Others have been ridiculous, comparing the September 11 attacks with abortion. My readers on various sites know full well that am I strongly pro-life (as shown here, for instance), but I strongly object to absurd AHA comparisons of September 11 with abortion. Yes, abortion must be eliminated, but using illogical arguments and manipulating emotions is not the way to do it. Doing this is a mockery of the suffering of those who died, their families, millions of other people — and the military. There are other situations where the attacks have been used to further an agenda, but the atheist and AHA examples are the most egregious to me. Most of the rest of the world was united in the suffering of Americans for a short time, but have left us behind in intervening years. This is most likely due to leftist politics in this country and ridiculous "leaders" who have alienated former allies. Conspiracy theories. There are people who can't suppress their consciences over little things like the "Alien Autopsy" video, imagine how many thousands would be involved in the murders of so many people. Further, conspiracy theories have been thoroughly debunked, but some pinheads still insist that the attacks were an "inside job". Bad political leadership allows Mohammedan "refugees" into countries without vetting them, while keeping true refugees like Christians behind to continue to be slaughtered. Islam is being excused and coddled, many countries are feeling the effects, and it continues. Blatant stupidity. Frankly, I believe the problem is spiritual; nobody can be so stupid unless we are under God's judgement and he's letting our inner nature run loose without restraint. Here I'll be controversial. People gave — I gave — to those left behind by the terror attacks. They got wealthy! Why are the lives of people in office buildings worth millions of dollars, yet the soldiers who fight to preserve our freedoms only worth a pittance, financially? We've forgotten. There was a short period of national unity, now it's leftists advancing their agendas and waving their bony middle fingers in the faces of Christians and Conservatives. Patriotism is not cool. Well, except for several country music stars, and a few surprises in the rock industry, most recently, Kiss. While writing this, I had tears in my eyes fifteen years after the fact. The memories are still there. It's not only adherents of Islam who need salvation in Jesus Christ, but professing atheists, liberal professing Christians, and the average John and Jane who never really thought about their eternal destinies. We need to get back to our foundations as individuals and as a society. ADDENDUM: Some similar thoughts from a different approach can be found in "Big Science’s Distorted View of 9/11".